Profiling and copy dressing of grinding wheels, make high demands on profile retention capability and thus on wear - resistance of the diamond tool. Wherever diamond blade type tools can not meet these requirements due to the specific grinding wheel geometry, precision ground shaping tools are the solution. Shaping tools feature the unique "structure-cut" to ensure optimum tool life. They are manufactured only from the highest grade of natural diamonds and undergo stringent quality control during manufacturing. ♦ Choose a diamond with the largest included angle and toughest geometric shape allowed by the profile requirements. ♦ Use a drag angle, where possible to maximize cutting edge life. ♦ Make sure that the tool is rigidly mounted. 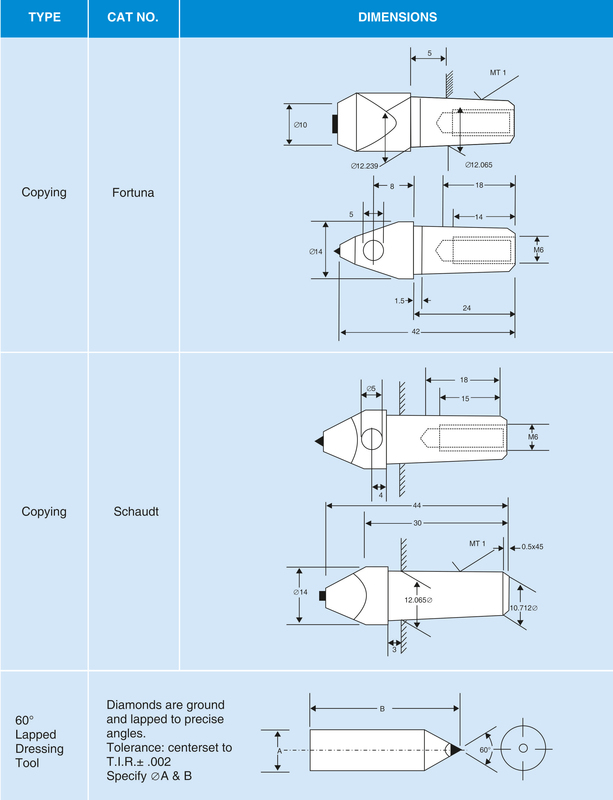 ♦ Follow machine manufacturer's instructions and recommendations.